The Fifth Annual “Civil War Living History Day” will be held at the Wooster Library in the front yard, the area inside the library front door, and the conference room. The Wayne County Civil War Roundtable, in collaboration with the Wayne Co. Libraries, is hosting the day. There is no charge and the event is open to the public. We are commemorating the 150th Anniversary of the Civil War two years and one month after Gen. Lee finally surrendered. The horrific war had gone on for four years almost to the day. A highlight of the day will be the 73rd OVI Regimental Band directed by John Huffman with their original CW instruments playing CW era songs. 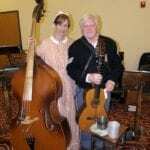 Another highlight is Steve and Lisa Ball with their original CW era Martin guitar and a string bass telling and singing stories of the Civil War. The Balls will also do a program on Stephen Foster songs. During the day you will be able to visit with CW infantry soldiers and their encampment; artillery experts with cannon & limber; some CW officers (both North and South); and a civilian Confederate couple from Dover, Tennessee. Also a CW cavalry soldier and authentic “gear”; a CW Surgeon with his gruesome instruments plus nurse “Mother” Bickerdyke, “Buffalo Bill”; a display of beautiful CW dresses; CW era spinning and weaving; plus CW artifacts & literature; and more. Pres. & Mrs. Abraham Lincoln are also expected!